I reckon planning and preparing ahead are key to paying less for your food. My food shopping plans for February went out of the window earlier this week, as posted here, but I did manage slightly better on the cooking front. On Thursday I seized the chance to do some batch cooking, as I could see we had a busy weekend ahead. Some recipes lend themselves particularly well to cooking ahead, like soups, stews and curries. Cooking large quantities can save time and money. It’s time saving because it doesn’t take much longer to prepare a bigger batch, but then you’re sorted for several meals afterwards. It’s money saving because it means my husband can take in portions for his packed lunch, rather than forking out for sandwiches. Having a few handy boxes to heat up helps remove the temptation to resort to more expensive takeaways or ready meals, if I’m tired or in a hurry. Hopefully it should also minimise food waste, if you’re able to chuck in larger quantities of veg, rather than leaving them to rot. Just remember to be realistic about when you might eat the extra portions. Consider stashing some in the freezer, if you’re lucky enough to have one, rather than risk binning boxes that get forgotten at the back of the fridge. I started off with some carrot & coriander soup, designed to use up a couple of tired potatoes and a packet of fresh coriander that wouldn’t stay fresh for much longer. This soup seemed the perfect option when I saw the carrots on offer at Morrisons. When I get the time, I’m a big fan of soup. It’s warming in winter, filling when I’m trying to be virtuous, and a great way to use up odds and ends of tired veg. I chopped the veg while the children were eating their breakfast, and then left it simmering while I urged them over the assorted hurdles of getting dressed, doing teeth, brushing hair, reading practice and bag packing. I’d also bought courgettes and aubergine so I could use up some unloved green peppers as ratatouille, when mixed with garlic, onion, tinned tomatoes, olive oil and mixed herbs from the store cupboard. Again, ratatouille is the kind of food that requires effort at the start, with all the chopping, but then you can wander off while it continues cooking. So in the evening I looked up a few recipes, and got inspiration from a Mary Berry recipe to roast the aubergines, peppers and courgette first, rather than having to hover over a frying pan browning batch after batch of veg. I thought I might as well take advantage of the Aga roaring away in the background to bung in a couple of trays of veg. The ratatouille was squirrelled away for packed lunches and dinner another day. Finally I unearthed half a pack of mince from the freezer, and made some bolognaise sauce bulked out with chopped onion, chopped celery and grated carrots. I’d run out of beef stock cubes, so I added some Bovril instead, along with tinned tomatoes, tomato puree, garlic, Worcestershire sauce and a slug of red wine. 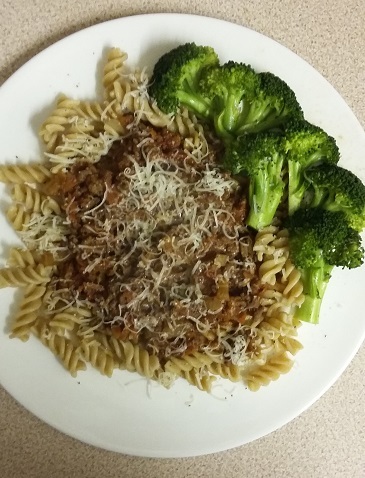 My husband and I ate it with brown pasta, broccoli and a sprinkling of grated hard cheese (value range version of parmesan, try grana padano if you’d like another lower cost alternative), leaving some leftovers for another day. 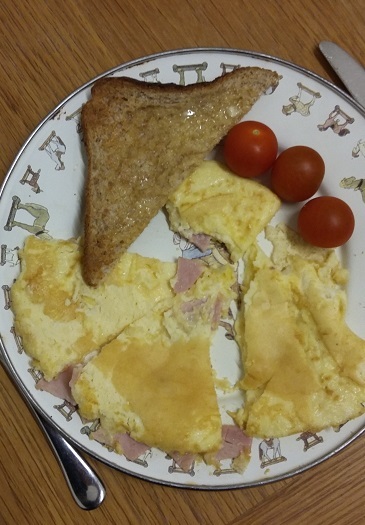 With all this frenzy of cooking, I was glad the children were up for omelettes in the evening, which were quick to cook while the bolognaise was simmering away. 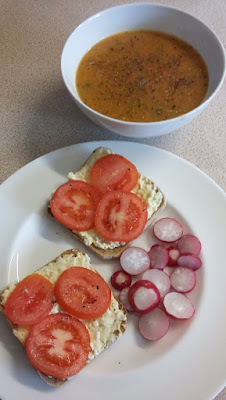 Lunch: carrot & coriander soup, egg and tomato sandwich, radishes. 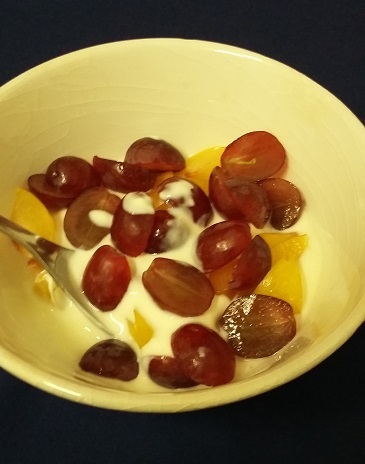 Snacks: Yogurt with grapes and plum, and yogurt tubes and toast for the children. Do you have any recommendations for recipes to cook ahead or make in bulk? I think batch cooking is the reason my freezer is filling up instead of emptying. Every time I buy a few fresh ingredients I end up making the best possible use of them and having a few more meals to go in the freezer. So although my Challenge has been going on for six weeks the freezer does not appear to have emptied at all !! It will be very interesting to see how long all your shopping lasts, along with the things you already have in store during this month. Yes, you might think you have 'over shopped' slightly but I think you will do really well with what you have bought.